How to decode Income Tax Intimation 143(1)? Home » Incometax » How to decode Income Tax Intimation 143(1)? 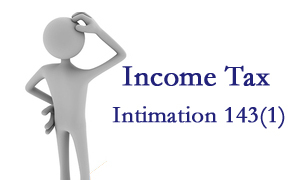 If you are in receipt of Income Tax Intimation 143(1), you may be worried about what exactly it is and how to decode it. In order to help you I am herewith detail explanation about Income Tax Intimation 143(1). Income Tax Intimation 143(1) as name suggests it is just intimation and not Assessment order or Scrutiny. This intimation 143(1) is auto generated communication by Income Tax Department without any human intervention. This intimation will be sent on email address provided in ITR from. Receipt of intimation 143(1) means completion of assessment process for the financial year unless there is tax due from the tax payer. In case of any difficulty or delay in the receipt of refund, kindly call the State Bank of India Call Center number 18004259760 to know the status of refund. Interest on refund is Interest under section 244A of the Income Tax Act, 1961. This amount is computed up to the date of issue of the refund. Net Amount Payable is tax amount due from tax payer. This will be treated as demand notice for the payment of income tax due. This Intimation letter encloses challan form to pay income tax if the due is more than Rs 100. In case of Demand, this intimation may be treated as Notice of Demand under section 156 of the Income Tax Act, 1961. Accordingly, you are requested to pay the entire Demand within 30 days of receipt of this intimation. If you are not satisfied with the intimation u/s 143(1), you may seek rectification as per section 154 by filing an online application for rectification, for which details are available on website http://incometaxindiaefiling.gov.in with your User ID and Password and choosing Rectification Request under My Account section. « Kisan Vikas Patra (KVP) is Back – Should You Invest?